We have a laboratory in our house. Cupboards and drawers hold measuring tools. There are instruments for fine incisions. Books containing step by step procedures for changing states of matter and combining particles into mixtures line up like sentinels at the ready along one workspace. We have burners and faucets; we have tools that break large pieces of matter into smaller pieces. Test subjects wait on couches and in chairs just outside of our lab. We have an art studio in our house. Several storage units hold materials in all shades and hues of pigments. We can arrange colors into familiar or unfamiliar shapes. When we present work from our studio, we think about form and line and space. We make fanciful works of art, as well as serious ones. Sometimes we throw whatever materials we have together to see what emerges on our surface. Our laboratory and art studio are the same room. We often read poetic language in this room, and sometimes we write our own. We practice math in this room, too. I’ve written before about the use of our kitchen as one of our favorite learning spaces. Math, science, language arts, critical thinking, life skills, even (occasionally, if I bring the research) some history: it’s all here. I often think of our kitchen as our “life lab,” a place where often the most highly contextualized learning takes place. Our kitchen is the place in which to experiment. It is a place where Katie and Eric have been encouraged to be autonomous from the beginning of their lives. Bill and I cherish autonomy and independent thinking in our children. We want them to find their abilities and to celebrate being capable people who need us to do as little as possible when it comes to self-care. We encourage them, even push them, to fight for their independence. The good fight. I don’t mean to sass us or to be disrespectful; I do often tell them, however, that I want them to be as independent as possible and that, in our family culture, it is not appropriate to ask others to do work for us, if we could do that work for ourselves. We should not want to live off the productivity of others. Favors are one thing; servitude is another. Working hard and proving oneself capable is a source of self-worth, we believe. So I have been extremely proud of Katie, as I always am, for her recent strides toward autonomy and self-sufficiency. One advantage to taking a rest day from running on Saturday mornings is that the kiddos have some time downstairs without me hovering around and running the cruise ship. I stay in bed for just a bit, and Katie and Eric have time with their dad, time to use iPads, time to watch cartoons, and time to invent. Katie has been making little food items for herself and others for awhile, but lately at age six, she has really pushed herself to excel and learn even moreso. A few weeks ago, I came downstairs and she had made—from scratch, entirely on her own, with NO recipe and just her own understanding of the process—some cupcakes. She has made numerous snacks for our daily morning snack time and recess. Pictured above are Katie’s Banana Bites. One afternoon she was reading a book about a tea that inspired her to make an afternoon snack for us: ladybug cookies (she used some of the leftover graham cookies from Miette as the base) and goat milk yogurt and honey dip for apples (I did cut the apples). What she does here, she does on her own. If I am not in bed on a Saturday morning, I have been either teaching Eric or doing chores like putting away laundry. Yes, she uses food dye on her own. She gets into the flour, sugar, salt, anything she needs—on her own. She uses knives I have deemed appropriate based on her skill level—on her own. Shortly after this snack, she became really enthusiastic about putting on a tea for lunch one afternoon for the three of us. Okay, let’s do it, I said. What do you need, I said. The sneaky English teacher in me said, write down the ingredients during Eric’s art class. She also ended up writing out her menu. We could also easily turn this into any number of English assignments, actually. After Eric’s art class, we went shopping at the corner market. We came home, finished up a couple of assignments, and then I turned her loose. L.O.O.S.E. I can’t emphasize that enough. No one can experiment properly with a helicopter parent buzzing around. When she gets into her zone, she hums and sings and is so happy. Who am I to intrude? She did ask for help a few times, and this was the extent of what I did: cut her apples, showed her the steps for whipping cream in the Kitchen Aid, cut the celery, got out the rolling pin and showed her the steps for making her pinwheels she had read about. The rest was all her. She made: ants on a log, strawberry jam pinwheels, more goat yogurt dip (dyed blue this time), raisin-date bread triangles with cream cheese and bananas (she cut the bread herself, squares into triangles—MATH! 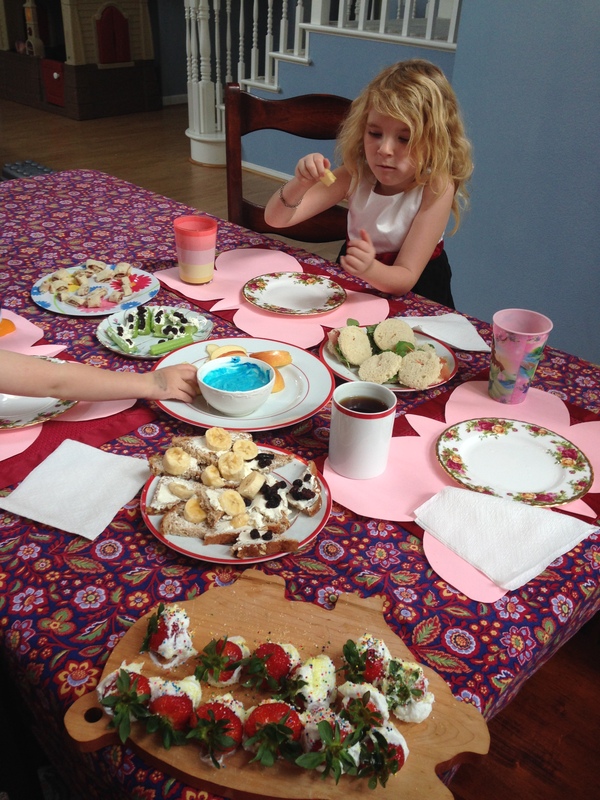 ), circular tea sandwiches with proscuitto and watercress, and strawberries dipped in whipped cream with sprinkles. She was at it for awhile, and Eric and I were starving by the time the tea was ready…but it was so worth the wait. 1. When Katie was 3, I cleaned out a whole bottom cabinet, as well as low shelves in both the pantry and the fridge. I stocked the cabinet with her cutlery, a basket of napkins, plates, placemats—anything she would need to set up her snacks, meals, or to help set the table. On reachable shelves were also her snack items, or items that could be turned into a snack with a bit of preparation. Our children must always, always ask permission to have a snack, but I wanted to have something in place for her to grab if that permission was granted. So, in short, she felt the kitchen was highly accessible and that she was expected to know how to participate in its workings. 3. I don’t care about mess in the name of learning. I keep a clean house for the most part. I dislike dirty floors. I vacuum almost daily. But I don’t care about mess when we’re working on something. And if I start to care, I tell myself not to and stay quiet about it. I can get to it when we’re done. Not when we’re doing art. Not when we’re cooking. Not when we’re doing a science experiment. Learning IS messy. Children, when they are creating, are messy. There will be chaos. It won’t all be “correctly” done. But in my philosophy of teaching, that does not matter. Look, I have seen numerous parents in my son’s art class who want to do the project for the kids. Oh, is that you at age 33 able to do a project designed for a 2-4 year old age range? Good for you. What about letting the child do it? Sometimes I want to scratch my eyeballs out, seriously. Please, for the love of all that is good, we are not making museum-worthy heirlooms, people. Back off, please. Children need a chance to practice, without interference. If they are confused about a step in the directions, sure, by all means model it once or twice until they get it. But what they produce is good enough. More importantly, it is an important marker of where they are and what skills they have at this moment in time. That snapshot of what they are able to produce ON THEIR OWN is significant information. How can we measure growth if we insist on putting our hands on their art and making it look like we think it should? By the same token, if Eric helps me polish the wood at home, do I hurry right over it with my rag? No…we talk about it. He gets chances to keep improving at it. It’s always been the same in the kitchen. 4. Whenever my children help me in the kitchen, they are given ability-level tasks to do, from the get-go. They measure. They pour. They crack eggs. They miss…flour goes places…egg goo gets on the counter… Their legs get covered in whatever we’re working on. But they do it. Practice, practice, practice. I let them help. As Type A as I can be, I also know when not to be Type A and can hold it back. It is more important that they learn, in my view, than that things stay neat or that they have to be done my way. I can always clean up later. They have to have time and room to get good at cooking. How will they get good at it if they are not allowed to be chaotic at it first? This post was beautiful and full of informative reminders of things I would like to do with Tessa as she gets older. I agreed with what you said about holding babies and narrating life! Tessa now demands that at 7 months! I truly appreciate your writing Sarah. It’s something that is pertinent to my life as a new mama, and your blogs are the perfect length for me to quickly read when I get a little break. Thank you for sharing!